Thanks to Dave Gelly and his book AN UNHOLY ROW, I found out about the magnificently subtle musician, trumpeter Ian Robert “Spike” Mackintosh, and wrote this in his honor. Ian Cuthbert, attentive and generous, pointed me to one volume of the British singer George Melly’s autobiography, OWNING-UP, where there was a brief but memorable “pen portrait” of my elusive hero. Here it is — and I am pleased that Spike in person is as singular as his trumpet playing.
. . . there was a whole generation of jazz musicians in England who predated the revival [which Melly dates as beginning in 1951] and yet played swinging music in the Harlem style of the late thirties. Some were professionals . . . . Others were amateurs, and the most remarkable of these was a timber merchant called Ian “Spike” Mackintosh who played trumpet in the style of mid-period Louis Armstrong. Small and neat, a little mustache and horn-rimmed spectacles, he looked exactly what he was, two sons down at Public School and a house at Cuffley. But inside him was a wild man in chains. He played with extreme modesty, his back to the audience, and a green beret full of holes hanging over the bell of his trumpet. In conversation he was both courteous and restrained, but he could become very aggressive if anyone suggested that there was any other trumpet player except his hero. At parties there was a psychological moment when he would lurch towards the gramophone and take off whatever record was playing if it hadn’t got a Louis on it, and substitute one that had. Another anti-social habit was his reaction when his host turned down the volume. He’d just wait until he wasn’t looking and turn it up again. He once offered Mick [Mulligan] and me a lift home from a suburban jazz club in his car, and when we were safely inside, drove all the way out to Cuffley despite our protests. His wife was away, and he wanted us to sit up all night listening to Louis and drinking whisky. It was an enjoyable night, and it didn’t finish until three p.m. the following day when the local closed. It was just that we hadn’t planned on it. Mackintosh’s friends were another hazard: huge city men in waistcoats, and pre-war musicians with patent leather hair. . . . despite Mac’s party tricks and city mates, we all liked him very much. He was kind, loyal, and generous, and he could, when on form, play absolutely beautifully. This comes from pages 100-1 of my paperback copy of OWNING-UP — a book whose spine was nearly broken at those pages. Was its previous owner also looking for Spike? Spike was a well-off London timber merchant with a passion for jazz and Louis in particular. 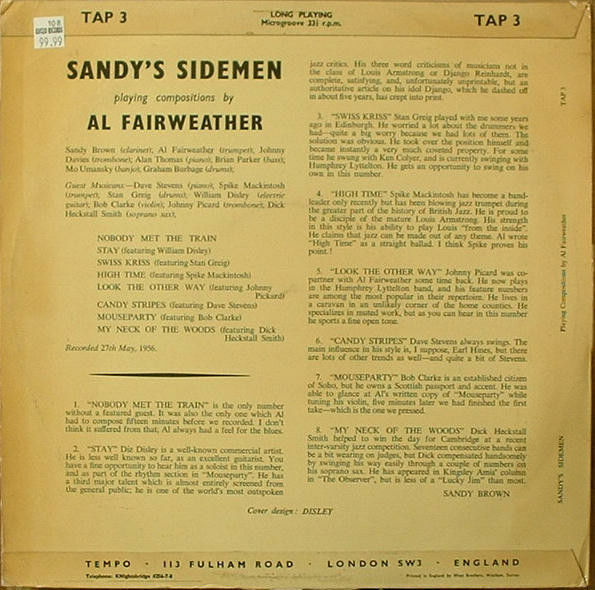 To my knowledge the only sides he cut commercially were the feature on Sandy Brown’s ‘Sandy’s Sidemen’ and the Wally Fawkes sides you have on Lake. Like Wally he was never a professional, and in his early days was an inveterate sitter-in. 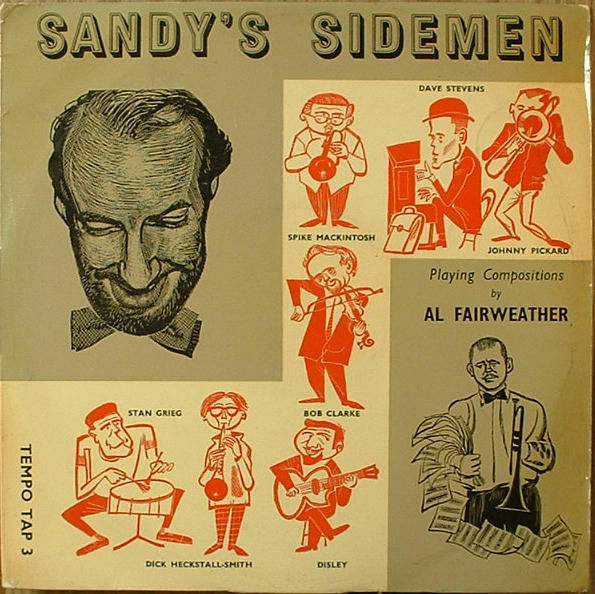 Sandy featured him usually on the 100 Club alfresco Thursday night. He had three loves – his sons (all well positioned, especially billionaire Cameron), Louis Armstrong and booze. As he got older the latter dominated and it was hard to get him to play, although he often carted his trumpet around. I persuaded him to do a few numbers with my band at a Edinburgh Festival sometime in the late 1980’s, and that was unusual. Stan Greig and I, though, did spend many hours with him at my flat in Edinburgh (he always attended the Festival), listening to Louis, Jabbo Smith and Jack Purvis. He loved to talk about and listen to jazz, and was a founder member of the Codgers, a group of London musicians and ex-musicians who cared about music (and a drink) – Wally, Stan, Ian Christie and Jack Hutton (ex-Melody Maker editor) among them. When he died his sons mounted the greatest jazz wake in British history at the ‘Pizza On The Park’ taking over the downstairs supper/night club and dispensing endless refreshment to most of the jazz fraternity. Those present and still alive remember it with awe. The surviving Codgers still host an annual Xmas dinner in his memory. He was a lovely man, unlike most, endearing and funny in his cups. I miss him. Spike McIntosh played trumpet with the Wally Fawkes Band in the late 1950s. He was a great fan of Messrs Gordon’s and Louis Armstrong. In fact I suspect his real reason for playing the trumpet was to capture other musicians and take them home with him in order to drink the product of one and listen to the product of the other. There is a lovely story about Spike McIntosh being at a party at Wally Fawkes’ house. In those days Wally had a large divider in his main room which was covered in pottery, glassware, bowls of fruit and that sort of thing. Typically, Spike was among the last to leave and, as he got himself out of an armchair, he stumbled into this divider which crashed to the floor with Spike sprawled across the wreckage. . . . . he was blown up . . .in the Egyptian desert during Montgomery’s rout of Rommel, at the Battle of El Alamein, and was rescued by some passing Bedouins who took him back to Cairo where he lay unconscious for three months. While recuperating, he was summoned to play for King Farouk, whose son loved jazz. Throughout his adventures, Dad’s trusted trumpet never left his side or his hospital bed. Jazz was his life and he played with a veritable Who’s Who of British jazz (Humphrey Lyttelton, Wally Fawkes, Sandy Brown to name but a few). He even played with his hero Louis Armstrong whose style he closely mirrored, and, at one impromptu gig, Louis borrowed Dad’s treasured Selmer trumpet so he could join in. However, Dad had to make a living as a timber merchant to feed and educate three hungry boys — especially me — as jazz simply didn’t pay that much. The fact that Dad couldn’t make music his sole profession had one silver lining for myself and my two brothers, Nicky and Robert, as he always encouraged us to do anything we wanted as a career. His other great example was that he always went through life thinking the best of people — ‘jolly good chap’ — and was genuinely disappointed if they turned out to be ‘a rotter.’ This was counterbalanced by our mother’s far more beady approach to life. Having met my mother Diana in Naples towards the end of the war, when they were both working for E.N.S.A., the Army’s entertainment division, he was no stranger to the flamboyance of show business, so I had no opposition to my dreams of being a theatre producer, nor did my youngest brother, Nicky, in becoming a chef or my middle brother Robert, in going into the music business, as both a writer and a record producer. Dad still managed to play regularly throughout his life and made several terrific recordings with his colleagues. In retrospect, one of his other great gifts to us was taking us to see many of the jazz greats in their prime and sometimes introducing us to them after the show. Who could forget the dazzling concerts of Duke Ellington, Count Basie, and Louis Armstrong? The brilliant trombone playing of Jack Teagarden, the haunting saxophone of Johnny Hodges, the dazzling piano playing of Art Tatum and Earl Hines, and going to an intimate Ronnie Scott’s to see Ella Fitzgerald. Every time I hear these great artists on the radio, I go, ‘Thanks Dad,’ and hear him ‘Zaba Doo Zatz’ in his inimitable musical ‘Satchmo’ growl, as he gratefully sips another pint. Spike, caricatured, at the top. and a few words by Sandy Brown about Spike and his work on the “straight ballad,” HIGH TIME. I need to know more about the reticent creator of such beauty.